Ford is bringing the Spotify music streaming service to cars equipped with SYNC AppLink for simple hands-free, voice-activated entertainment while driving. The updated Spotify application will be available in the Apple App store shortly. Spotify is a leading on-demand music streaming service providing access to a catalog of more than 20 million songs. 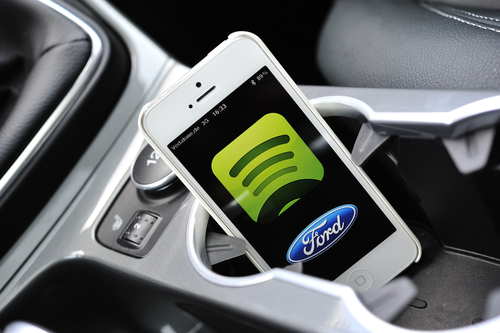 The integration of Spotify with SYNC AppLink is an example of the SYNC AppLink developer program announced by Ford in January. That program provides API's for smart phone applications to integrate with voice control features built into Ford cars. With AppLink, drivers of AppLink-enabled Ford cars will be able to to enjoy Spotify songs and playlists while keeping their hands on the steering wheel and their eyes focused on the road. More than 1 million Ford cars are now equipped with SYNC AppLink. Even Spotify's social network sharing features work while on the road, allowing friends to send albums, tracks or artists to your Spotify inbox, and the car will read it aloud; for example, “You have been sent a new playlist. Would you like to play it?” If the driver answers "yes" Spotify will start playback through the car's sound system. Spotify is also confirmed as the first music service provider for the upcoming launch of SYNC AppLink in Europe.